As Christmas 1884 approached, the people of St. Bride’s, Placentia Bay, were thinking it would not be a prosperous Christmas. It had been a poor year in the fishery. Their fortune was however about to change unhappily born on the pain of other families from Placentia Bay. As he sailed out of St. Bride’s for Great Placentia the residents of St. Bride’s no doubt celebrated. With their newly acquired abundance of flour and molasses, it would be a good Christmas. What was St. Bride’s Like? By 1891, the population had increased to 256, including four from Ireland. The 66 fishermen-farmers. The community also had a priest, a teacher and a merchant, and 65 of the 122 children were in school. The name of St. Bride’s is quite modern, and was given from the titular Saint of the Church of St. Bridgett. On more ancient maps it (St. Bride’s) was called La Stress, apparently a French name which became corrupted into Distress. This name “Distress” in 1876 was reported by the newly arrived priest Reverend Charles Irvin as “not being of pleasant sound” and having the authority of the church the priest changed the name from Distress to St. Bride’s . This entry was posted in Archival Moments and tagged Cape Shore, Distress, Dohey, Placentia, Rex Murphy, Schooner Stella, St. Bride's on December 11, 2018 by Larry Dohey. This entry was posted in Archival Moments and tagged Cape Shore, Distress, Dohey, Placentia, Rex Murphy, Schooner Stella, St. Bride's on December 9, 2017 by Larry Dohey. On October 28, 1961, the Sir Ambrose Shea Lift Bridge was officially opened by Premier J.R. Smallwood. Previous to the new bridge residents of the area were advocating for a bridge across the main gut through petitions presented to government as early as 1926.
in 1942 a scow was put on the Placentia gut by the Americans to transport vehicles (for travel to the wireless stations they had set up on the Cape Shore). They later replaced this with a pontoon bridge, but because of the strong tides the bridge could not be kept in place. The original Sir Ambrose Shea Lift Bridge consists of two approach spans and one centre vertical lift span each 100 feet in length. The total weight of the centre span which can be raised in one and a half minutes is 100 tons. Clearance under the span in the down position is 10 feet, and when raised is 70 feet. In May 2011 the Provincial Government issued a tender to replace the aging “iconic structure.” The new lift bridge Sir Ambrose Shea bridge was built directly adjacent to the existing bridge. The Honourable Dwight Ball, Premier of Newfoundland and Labrador, joined with the Honourable Al Hawkins, Minister of Transportation and Works, the Honourable Sherry Gambin-Walsh, Minister of Children, Seniors and Social Development, and MHA for Placentia – St. Mary’s, Ken McDonald, Member of Parliament for Avalon, along with His Worship, Wayne Power, Mayor of Placentia, and members of the community, to officially recognize the opening. The lift bridge is staffed year round, 24-hours a day. The bridge is lifted approximately 2,400 times annually for marine traffic and sees about 6,500 vehicles pass over per day. During the busiest spring months when crab and lobster fisheries are at their peak, the bridge can lift over 400 times a month. The new Sir Ambrose Shea Lift Bridge cost approximately $47.7 million, which includes construction, engineering and demolition and removal of the old bridge. The construction of the bridge saw the placement of 9,200 metres of steel piling, 3,800 cubic metres of concrete, 150 tonnes of reinforcing steel and approximately 976 tonnes of structural steel. New Word: Bascule Bridge from the French word for “see-saw,” a bascule bridge features a movable span (leaf) that rotates on a horizontal hinged axis (trunnion) to raise one end vertically. A large counterweight is used to offset the weight of the raised leaf. Recommended Archival Collection: At the Rooms Provincial Archives explore MG 83 the Bradshaw Family collection that consists of 7 files comprised of land grants for Placentia Gut and North East Arm, bills of sale, printed speeches and advertisements. also contains 2 maps, [ca. 1840] The maps are a Map of Ordnance property, Placentia 1806; copied 1881 and Plan of Placentia, 1741. This entry was posted in Archival Moments and tagged Ambrose Shea Bridge, Cape Shore, pantoon bridge, Placentia, Smallwood on September 22, 2016 by Larry Dohey. 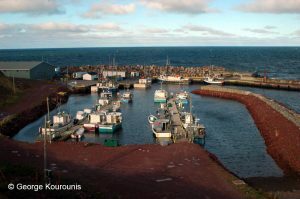 There was a custom in all Newfoundland communities whereby the local residents would greet all visiting dignitaries with a ‘loud salute of guns’ also known as “feu de joie.” If the dignitary was arriving by boat the men of the town would line the wharf with guns aimed to the sky shooting a volley as a sign of welcome. If the delegation came by road, the men armed with their guns, stood along the road, often near a green bough archway, that was created for the dignitary to walk under shooting the volley as he entered. In early August 1886 the men of Placentia gave a loud salute of guns from the “plaza” of Placentia that greeted the ears of Mr. George H. Emerson, MH.A., as he walked ashore into Placentia from the costal steamer, just arrived from St. John’s. Emerson was well known in Placentia, he had been elected the year previous as the Liberal member of the House of Assembly (M.H.A.) for Placentia and St. Mary’s. Upon hearing the “feu de joie” the locals noticed that Emmerson “doffed his sombrero bowing deeply and graciously, acknowledging the compliment extended to him” by the citizens of Placentia. It appears that the men of Placentia were not on the wharf to greet Mr. Emerson but rather they were there to ‘salute their guns” to their friend Mr. Fowlow who had just married and was about to depart the town on the same coastal steamer that the young politician had arrived on. The firing off the guns or “feu de joie“ as a young couple left the church, after exchanging vows, was a long established tradition in Newfoundland. Another tradition was to fire the guns as they departed the community on their honeymoon. Upon arrival at the hotel he quickly” ordered a cocktail, which soon put him in good feather again”. To take someone to Hyman’s altar was an expression that referred to taking someone to the altar to marry. Emerson, the Editor of the Evening Telegram suggested, would not receive the salute of guns (the Placentian feu de joie) until his marriage day. Recommended Archival Collection: The Memorial University of Newfoundland Folklore and Language (MUNFLA) comprises extensive collections of Newfoundland and Labrador folksongs and music , folk narratives , oral history, folk customs, beliefs and practices, childlore and descriptions of material culture. Explore your traditions at MUN!! New Phrases: — n , feu de joie a salute of musketry fired successively by each man in turn along a line and back C18: literally: fire of joy] . 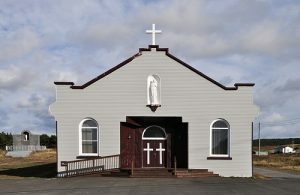 The custom continues in many communities in Newfoundland especially on the Cape Shore where guns are fired as the newly married couples leave the church. When was the last time that you witnessed a ‘salute of guns’ in your community? When was the last time that a green bough arch was erected in your community to welcome some dignitary? This entry was posted in Archival Moments and tagged feu de joie, green bough archway, gun, gun salute, Hyman’s altar, Placentia, Placentian feu de joie on August 26, 2015 by Larry Dohey. 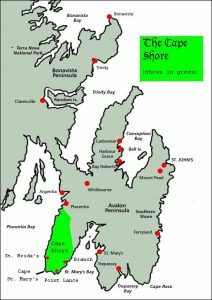 In August and September of 1762 if you were sailing about Newfoundland and happened into the harbours of Placentia, Harbour Grace, Carbonear or St. John’s it is likely that you would have met James Cook. Captain James Cook, (1728-1779) was a British explorer, navigator, cartographer, and captain in the Royal Navy. He may be best known internationally for his work in the Pacific Ocean, Australia, the Hawaiian Islands, and New Zealand, but it was in Newfoundland where he cut his surveying teeth!! James Cook first came to Newfoundland in the summer of 1762 giving six years of his life over to the survey of Newfoundland waters. When he arrived on our shores, most of the island was known only in shadowy outline. When he left he had scientifically surveyed almost all the unknown coasts. His charts with detailed sailing directions and remarks on suitable anchoring, watering and wooding places would serve well into the 20th century. “I have no doubt in a year or two more of seeing a perfect good chart of Newfoundland and an exact survey of most of the good harbors, in which there is not perhaps a part of the world that more abounds”. Two hundred and fifty years after Cook’s arrival in Newfoundland waters it is time to celebrate his accomplishments. You are invited to view the charts created by Cook on exhibit at the Rooms Provincial Archives and to join the Newfoundland Historical Society for the Cook Symposium. The opening lecture of the Symposium and reception will be held at The Rooms on Friday September 28 from 7:00 p.m. – 10:00 p.m. Please note that that the reception will begin at 7:00 PM with a lecture from Dr. Olaf Jenzen to follow at 8:00 p.m. The Symposium will continue at 10:00 a.m. Saturday morning September 29th at Memorial University’s Engineering Building. Parking is free and located in parking AREA 16, adjacent to the building. The symposium is free and registration is not required. Come for any or all of the sessions. For more information on the Cook Symposium: www.nlhistory.ca. Recommended Exhibit: Visit the Rooms Provincial Archives Reference Room where five reproductions of the Cook charts are on exhibit. This entry was posted in Archival Moments and tagged Carbonear, Governor Graves, Harbour Grace, James Cook, Newfoundland Historical Society, Placentia, St. John's on September 25, 2012 by Larry Dohey.